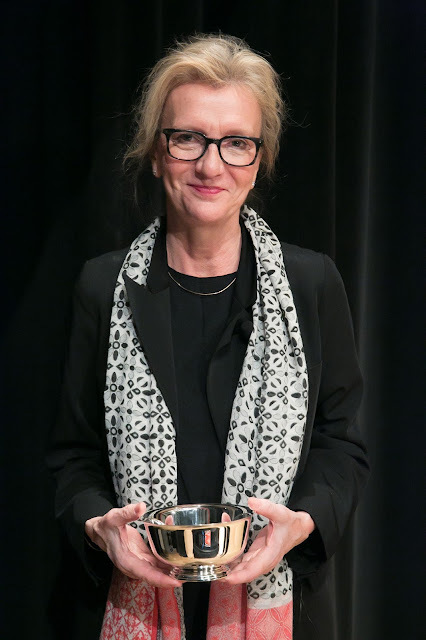 We're pleased to announce that Elizabeth Strout's Anything Is Possible (Random House) is the winner of The Story Prize for books published in 2017. The other finalists this year were authors Daniel Alarcón for The King Is Always Above the People (Riverhead Books) and Ottessa Moshfegh for Homesick for Another World (Penguin Press). At the event at The New School, all three finalists read from and discussed their work on-stage. Strout received $20,000 and an engraved silver bowl. As runners-up, Alarcón and Moshfegh each received $5,000. Congratulations to Elizabeth Strout and Random House! In the days and weeks to come, we'll post the judges' citations for the three books, photos from the event and after party, and a link to the video. Here's an advanced look at the program cover for The Story Prize event on Feb. 28, co-sponsored by the Creative Writing program at The New School. As always, everyone who attends will get an eight-page, full color booklet (designed by Steven J. Charny). You'll also get to see the finalists—listed on the faux bookstore chalkboard above—read from and discuss their work onstage before Julie Lindsey announces the winner. Tickets are $14, available online (with a small added fee) or the night of the event at The New School box office (66 W. 12th St.). Also, bookseller McNally Jackson will be selling signed copies of the finalists' books. 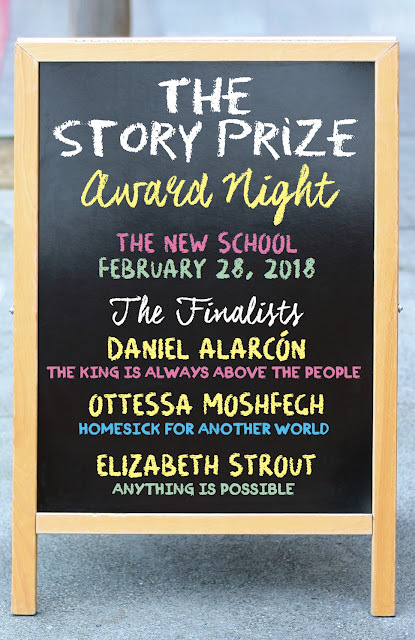 We're excited about hosting Daniel Alarcón, Ottessa Moshfegh, and Elizabeth Strout and hope to see you there.